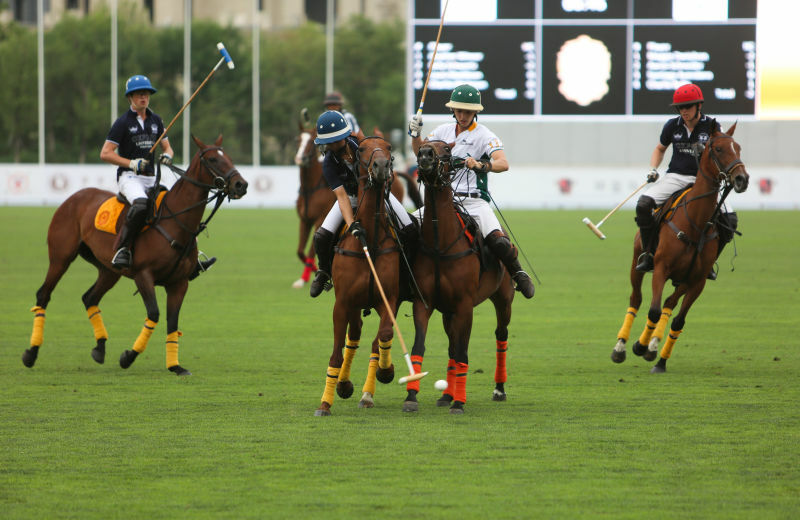 Tianjin, China, 12 July 2015 – Northeast China’s prestigious Metropolitan Intervarsity Polo 2016 invitational tournament kicked off with a bang this afternoon, with teams from Oxford and Cornell universities chalking up impressive wins at the event also known as The London Challenge. 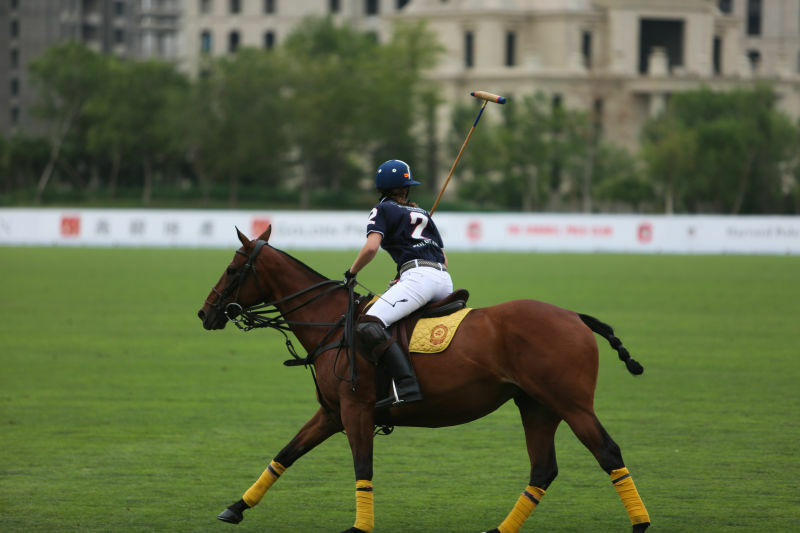 Taking place in the summer heat of the city of Tianjin the tournament, in its fourth year running, saw the local glitterati come out to watch Oxford University Polo Club show their vintage against debutants Skidmore Polo Club. Cornell Polo Club beat off the challenge of their fellow US university giants, Harvard University Polo Club. 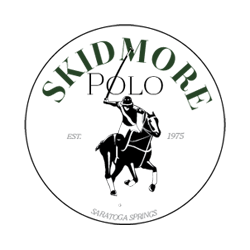 Cornell go on to face The University of London Polo Club, who have won the tournament twice in a row, tomorrow (13 July) in the next round. Oxford’s prize for today’s win is an enticing match-up with their fellow Brits and traditional rivals The University of Cambridge Polo Club. 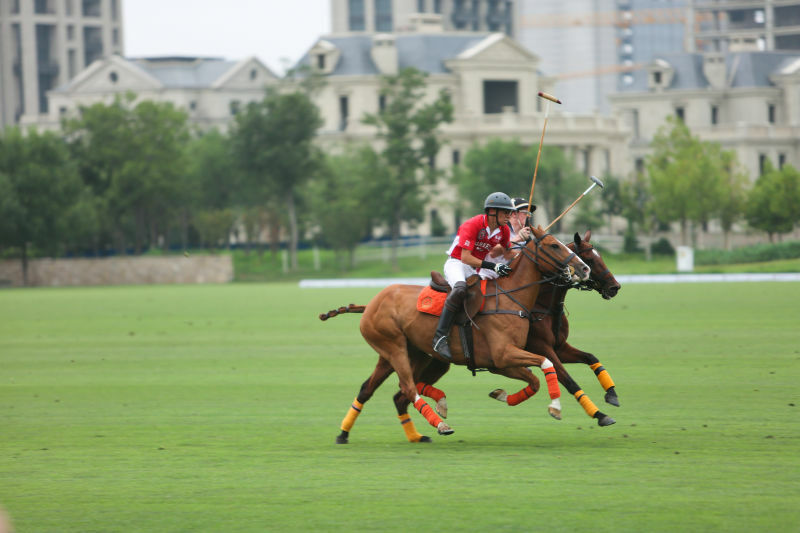 Cornell beat Harvard by a narrow margin, clocking up a 4-2.5 victory over four chukkas on the regal environment of the Tianjin Goldin Metropolitan Polo Club’s South Field. Under the shadow of the grand, under-construction Goldin Finance skyscraper, the impressive Dan Shaw opened the scoring for Cornell, who were playing in their striking scarlet match shirts, to put the team half a point ahead due to Harvard starting the game with a 0.5 point handicap advantage. Shaw’s performance for Cornell was only surpassed by his dominant team-mate Ryan Saul, who gave something of a masterclass in both offence and defence throughout the match. The two linked up well on the flanks, while for Harvard the nippy Danielle Lussi was marked out as the team’s creative force, making regular runs on the left flank to cause the Cornell defenders serious hassle. Lussi’s positive movement paid off in the second chukka, finishing off a fine flowing movement that looked to have been snuffed out by Cornell pressure before the impressive rider popped up seemingly from nowhere for a close range finish. Saul’s pedigree continued to show, however, and he put Cornell back in front later in the second chukka with a solid finish after his team-mate Emma Eldridge fluffed a good chance. He increased Cornell’s grip on the match to 3-1.5 in the third chukka with the best solo move of the game so far, smashing home with confidence after a confident surge forwards. He finished off what was surely a man of the match performance with a goal that will be the benchmark for the rest of the tournament. One minute into the fourth chukka he picked up on a through ball pass, calmly spinning his club with metronomic grace to thwack a looping super-long range field goal home. “Anyone would have been proud to have hit that,” yelled breathless commentator Derek Reid over the loudspeaker system as Saul earned the biggest crowd cheer of the day so far and sealed his team’s win. The Oxford team’s polo history dates back to its foundation year of 1874, and today the players seemed to bear the weight of their legacy with ease as they began dominantly against Skidmore, the team based in Saratoga Springs in New York. However, the latter team, making their first appearance at the Tianjin tournament, gave an impressive if somewhat belated fightback that meant that it was not all plain sailing for the Oxford players. Following Ryan Saul’s standard-setting performance for Cornell, Oxford’s Louis Maddison proved to be an even more decisive force, banging in six goals in the space of the game’s four chukkas as Oxford won by 7.5 points to 5. Oxford, playing in their trademark dark blue against the Skidmore whites shirts, started with a 0.5 handicap point advantage, extending their lead to 3.5-0 in the first chukka. Maddison showed his class to put away a diagonal pass towards the Skidmore goal. Minutes later, following some stop-start action in the middle of the park, Maddison turned provider to Charlie Hitchman, feeding him a delicious through ball for him to smash home. Oxford, fired up by their rampant start, scored again when Maddison made another clear breakthrough, leaving the Skidmore defence for dust before finishing coolly. Maddison’s fire didn’t to temper in the third chukka, as he put away a cross early on that the Skidmore players should have defended better against. The latter team found it harder and harder to impose themselves on the game, despite strong defensive work from standout player Charlie Bullis, who at times seemed to be the only player between Skidmore and their capitulation. Yet another run from Maddison looked to be setting him up for an easy finish, but in rare lapse of concentration he goosed his shot. But with the gods clearly on his side today, the attack wasn’t cleared properly and he found himself with an easy finish after a lucky bounce following Skidmore’s failure to clear. Despite the increasingly gaping scoreline Skidmore talisman Bullis was growing in stature, and after he put away a close-range penalty he could barely miss to make it 5.5-1, he seemed to click into a higher gear. Maddison scored with a penalty of his own early in the third chukka to make it 6.5-1, but then Bullis showed nerves of steel to displace two defenders on a scintillating run and swerve a high long-range shot to make it 6.5-2 – and to clock up a goal as impressive as any of Maddison’s. With one chukka left to haul back five goals, Skidmore seemed to have an impossible task. However, they shifted up yet another gear to provide the crowd with an exciting finish, if not quite overturn the match. Somewhat predictably, Maddison scored his sixth goal of the game before Skidmore’s Rafaela Itturalde found herself with a dead ball practically on the goal line for a super-easy finish following good thrusting attack work from Bullis. Bullis, throwing caution into the wind, easily converting a mid-range penalty then smashing home a cross-goal ball to make the score 7.5-5 with the hit that would prove to be the final one of the game. He had four goals under his belt, but somehow ended up on the losing team, led by the six-goal hero Maddison. 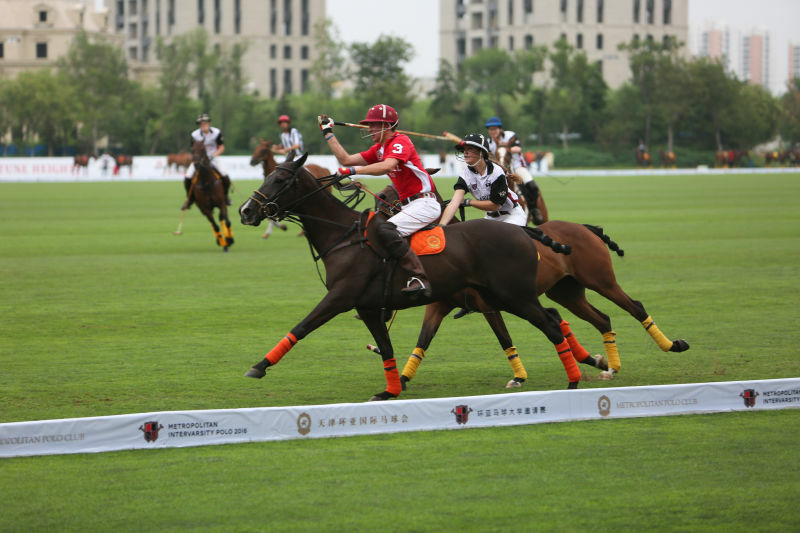 Both matches showcased top class international talent, and a glimpse of the future of Chinese players was given with an opening equestrian performance from young members of the Tianjin Goldin Metropolitan Polo Club. With the tone set for a fantastic week of polo, things should hot up even further with tomorrow’s matches.